After modification they were sent to Italy with s.Pz.Jäg.Abt.653, but that part of the story is not relevant for this kit. The name was officially changed to Elefant in February 1944. While modelers use "Ferdinand" for the early configuration and "Elefant" for the modified vehicles, the name-change was actually unrelated to the modifications. A Befehls version, with an extra antenna at the rear of the superstructure was also built. Worthy of note is that all vehicles already had the mount for this antenna fitted. 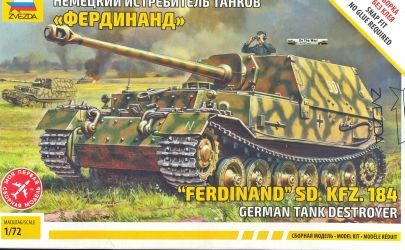 Three Bergepanzer Ferdinand were also built (without additional armor). 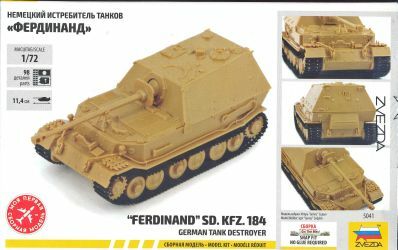 Modelers who would like to put the vehicle in a diorama might be interested to know that the vehicle had a six man crew and that crews wore both black and Feldgrau Panzer tunics . 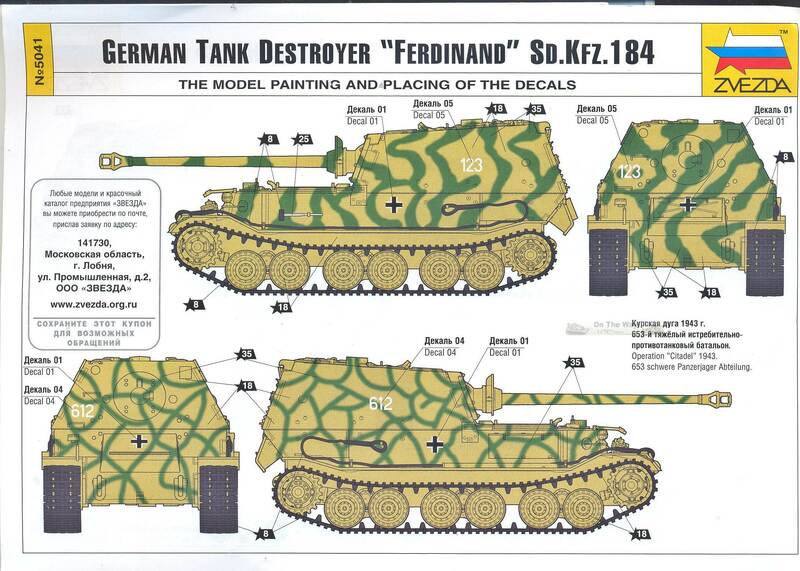 While regulations for Ferdinand crews required black patches (with skulls and pink piping) on both tunics, Litzen were also often seen on the Feldgrau version. 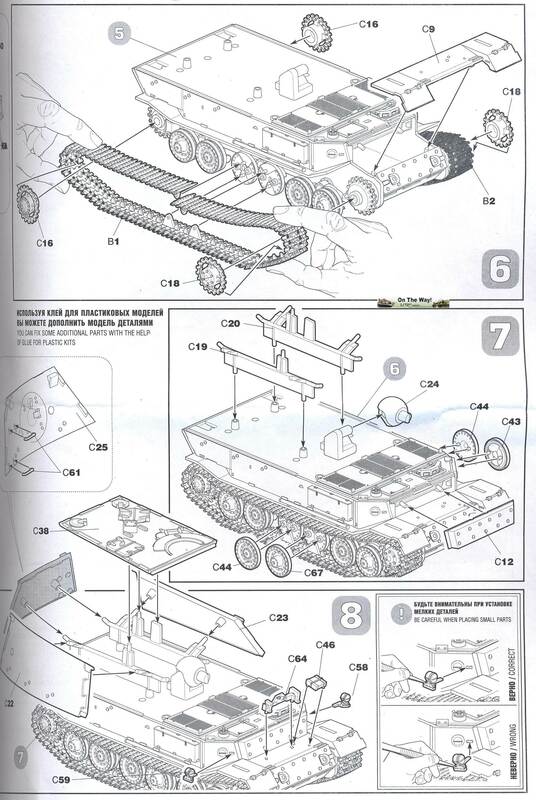 First of all, I need to mention that I followed the instructions, except for the tiny bits and for one of the tracks (but more about that later). 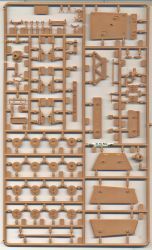 I also need to mention that the kit is well engineered, very well detailed, but glue will be needed to make the parts fit without gaps. Those of you familiar with the Zvezda snap-fits must also know by now that the plastic is very soft and that excessive amounts of glue will turn your model into a pudding of molten plastic. One of the attachments for the rear towing eyes (part C10) departed into Low Earth Orbit. I decided to scratchbuild two new ones. 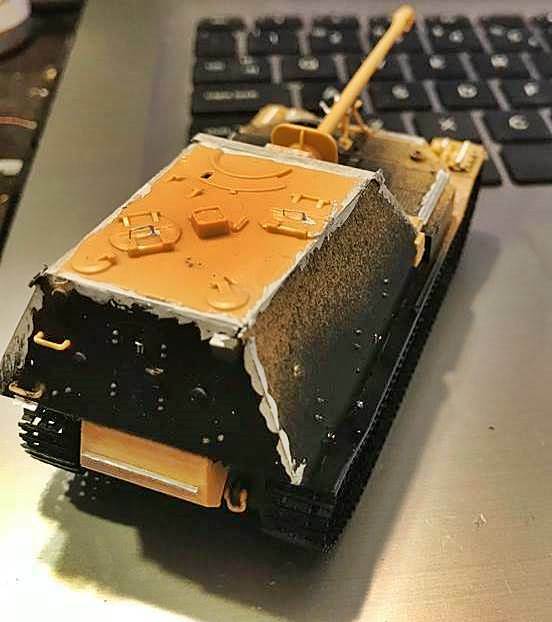 (One would have been sufficient, but I didn't manage to make my scratchbuilt piece look exactly like the remaining kit part.) 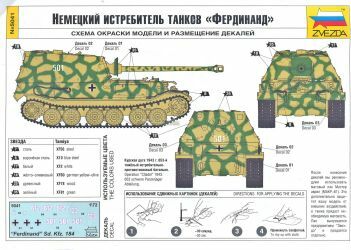 Note that Zvezda gives you double the amount of handholds (part C61) in case you lose those, but none for the towing brackets. 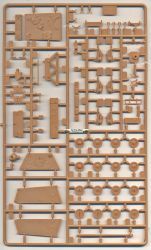 The fighting compartment is a complex arrangement of individual plates and internal fittings that will hold them together. The pegs for one of the parts for internal scaffolding broke, however, which fragilized an already rickety assembly. 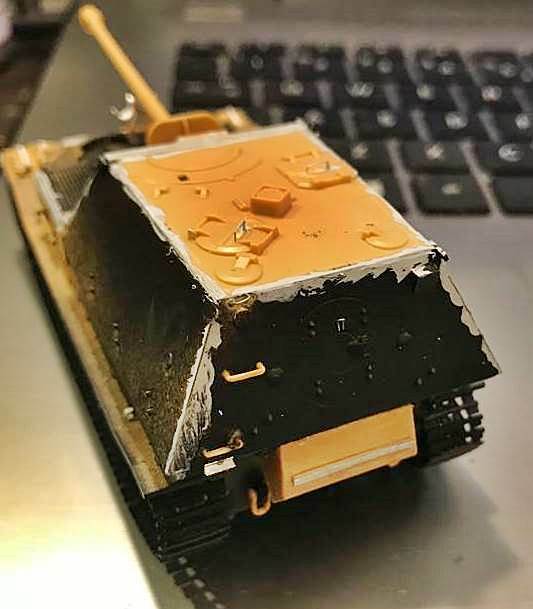 I don't know if this had anything to do with it, but the fighting compartment ended up with small gaps and a misaligned front plate (which I only noticed after painting). I guess that patience and gentle hands might come a long way to avoid this situation, but I was now in need of something to mask this elementary modeling mistake (see pictures). enamel paint and oil washes weaken the tracks; the brittleness then makes the track break at the most unexpected moments. 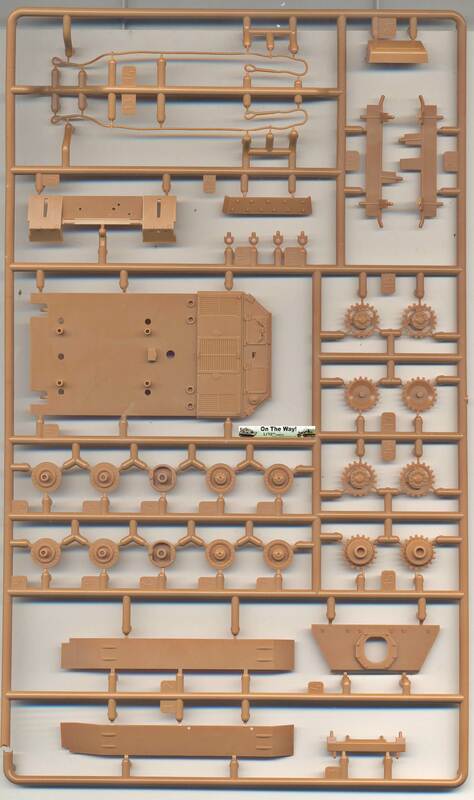 the tracks have eyes that need to fit onto pegs between the middle roadwheels, giving them a fixed position with respect to the whole running gear, including the teeth of the sprockets (front and aft). 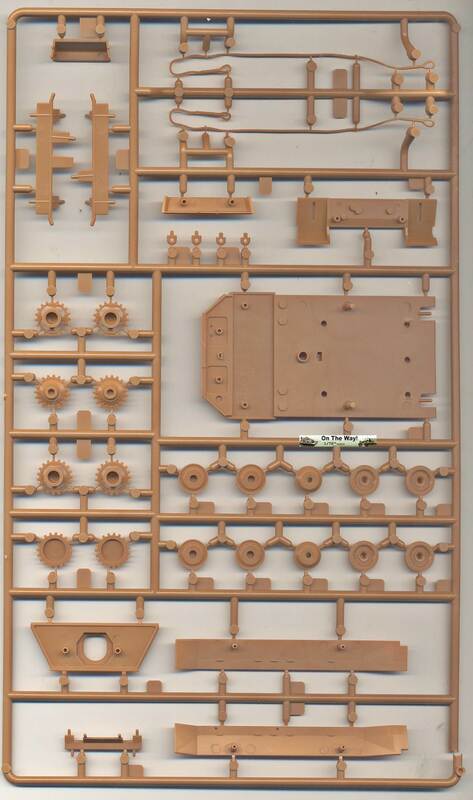 The latter need to be lined up perfectly, but don't rotate easily, and as the tracks are fixed in place due to the pegs/eyes, you will need to position the teeth of the sprocket very carefully. 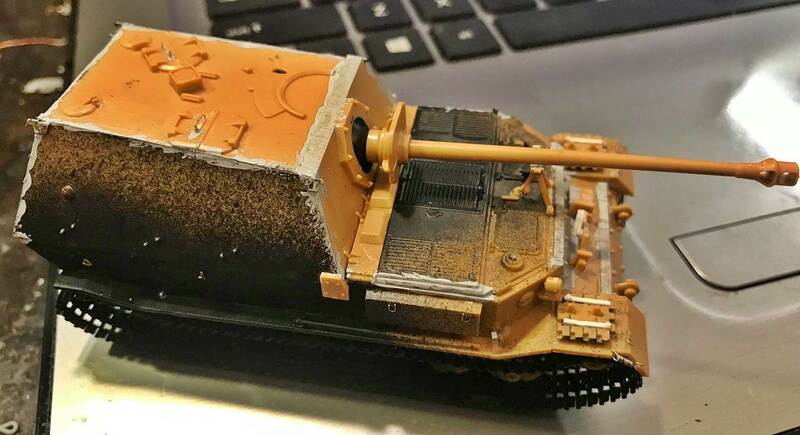 the glue needed to make the tracks fit snugly on said sprockets and other roadwheels generally weakens the tracks even further and, made from very soft styrene, mars the detail. I ended up with a broken right track, at the point of greatest curvature (where the damage is most visible, i.e. at the extreme front and rear). It was not all bad, as that left me with three stretches of sprue that were more easily installed, but in the end I had to resort to cutting two links from the bottom run and use them on the front end as the original parts were too damaged by the time I was able to make them bend to my will. Chastened, I decided to proceed differently with the other (left) track. 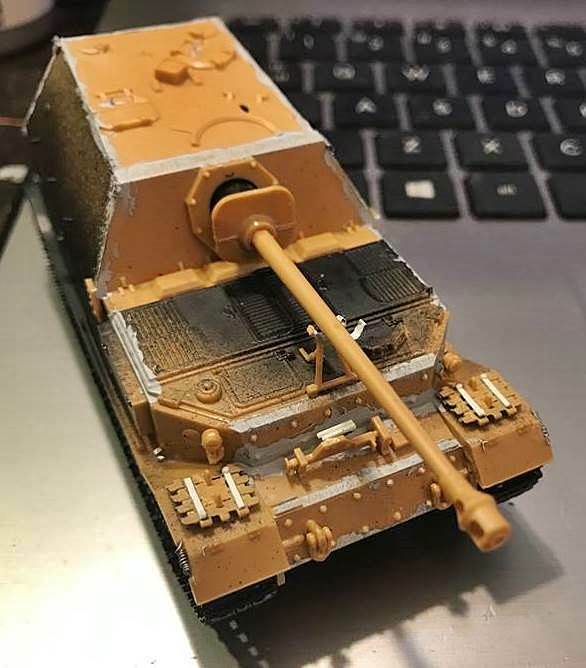 I cut of the locating eyes and cut up the tracks deliberately in 5 sections, in order to be able to work them without the need of an excessive amount of expletives. 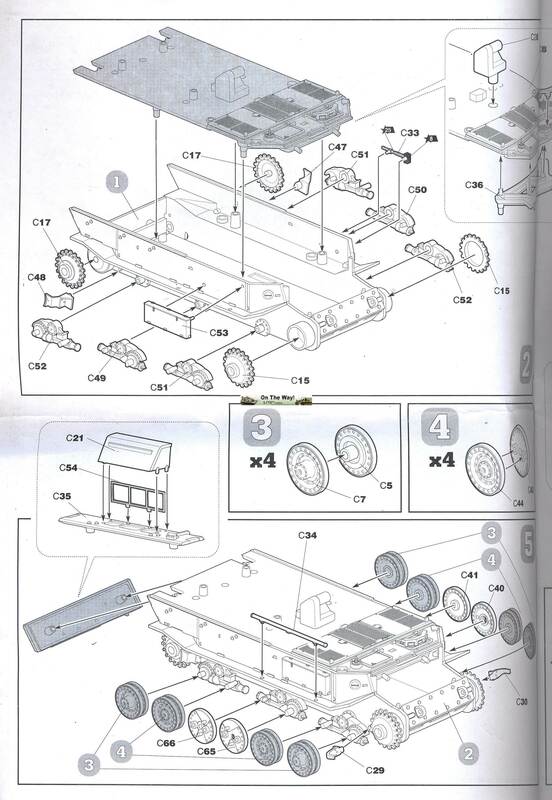 Note that there is almost no way to figure out in which direction the tracks need to be put on (even if you pay attention and install B1 to the right and B2 to the left) until you have completely wrapped them around the suspension. I think I installed them the right way around, but don't take my word for it. The two spare tracks on the front fenders are better installed early on in the build. You risk damaging the fenders when pushing them into place and the underside of the peg is (barely) visible on the underside of these fenders as it goes straight through, which means that any mud and dirt that you want to cover these undersides with will not have been applied to those areas. 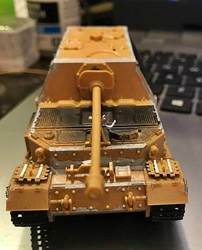 The gun mantlet is a tight fit and if you push it too hard you will dislodge the internal mount. At this point in the construction there is no way to go inside the fighting compartment to fix that. It is difficult to align the gun mount, gun shield and barrel, unless you glue them firmly in place. The barrel needs to be drilled out at the busy end. 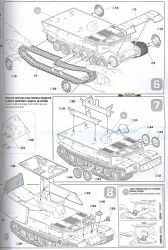 The only scale drawings I have of the vehicle are from , and while the book doesn't mention the scale of these drawings, I am tempted to believe, based on the real dimensions of the vehicle, that they are in 1/35. It doesn't help, however, that some of the drawings are spread over two pages, which means that you lose a part of them in the book binding. 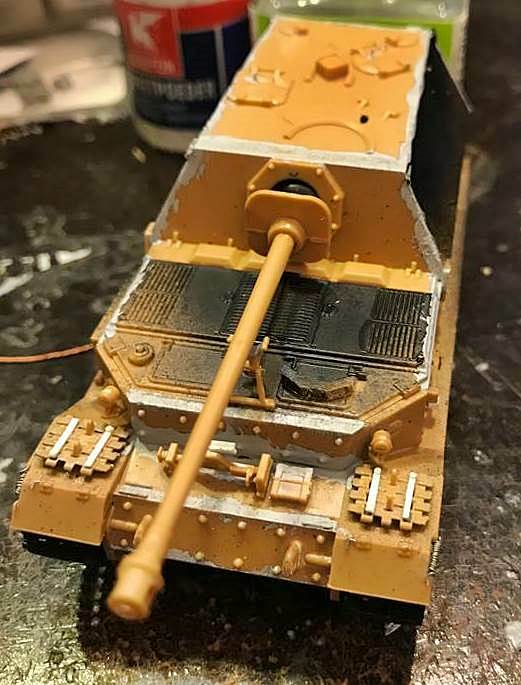 The kits scales out correctly for overall width, but the top of the casemate seems closer to 1/71 (being 0.2mm too narrow). 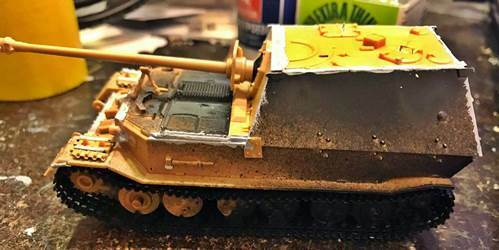 Length-wise, the top of casemate is ok, but at the base it is closer to 1/75 (1.5mm short). 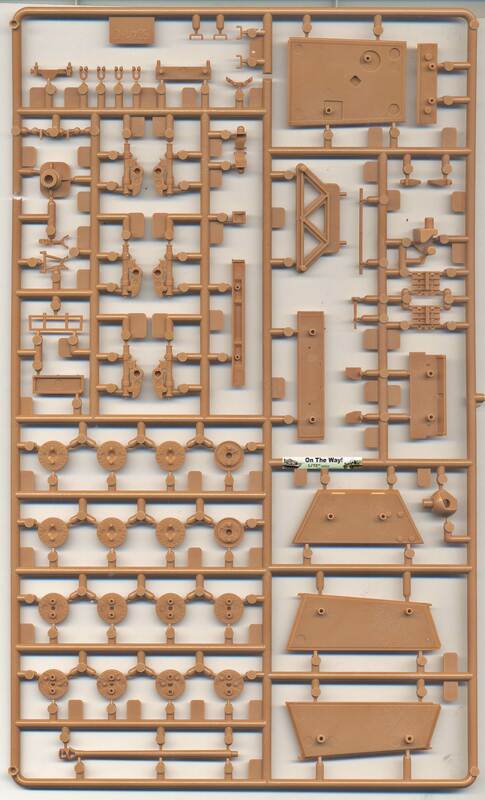 The engine deck is closer to 1/73, makig the overall length also closer to 1.74, being 2.2mm short. I wouldn't go as far as saying it is really noticeable, but if you pay attention, you might notice that the angle of the superstructure front plate is indeed a bit too close to the vertical. 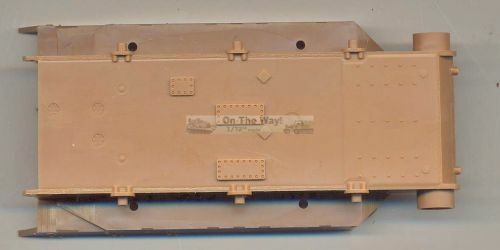 The salient details of the kit correspond well with the drawings in , with the exception of the size of the cover for the periscope and the shape of the loader's hatch on the roof. 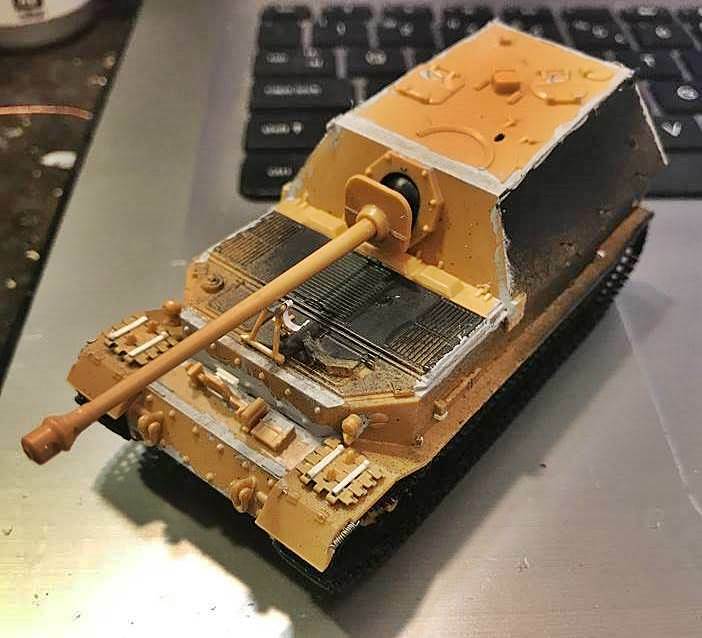 No periscope is provided, and the barrel support is only given in the raised position (but with the ring around the barrel open), meaning that an in-action representation will need a bit of scratchbuilding/modification. The exhaust, which, interestingly, were installed underneath the fenders are not represented in the kit. An antenna was added on top of the radio operator's compartment. 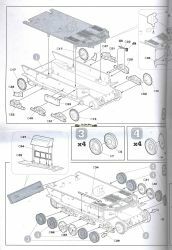 The small springs in the fender flaps are not represented in the kit. I didn't bother. A Battalion Tactical Symbol was positioned on the upper right corner on the rear of the Ferdinand's fighting compartment from July to December 1943. The vehicles were numbered in the 1xx-3xx range. From 5 July to 23 August 1943 a letter "N" was usually painted on the left front fender and on the rear hull, referring to the Abteilung commander Hauptmann Karl-Heinz Noak. 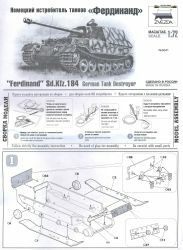 On 23 August 1943, s.Pz.Jg.Abt. 654 handed over all their Ferdinands to s.Pz.Jg.Abt. 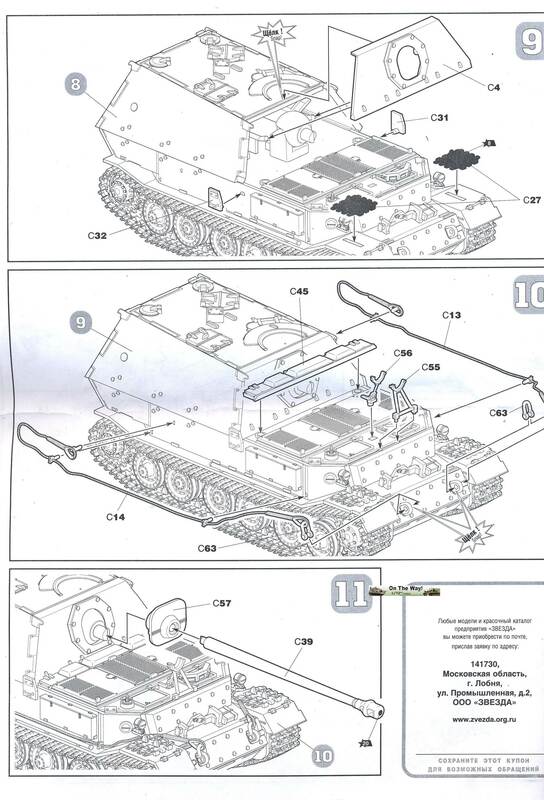 653 and returned to Orleans, France to be re-equipped with Jagdpanthers. What does this teach us about the marking options ? "123" is a s.Pz.Jg.Abt. 653 vehicle and thus should need the "tactical symbol", which the decals don't provide. Worse, though, is that the decals only give you two "123" decals, which is more than likely one too few. 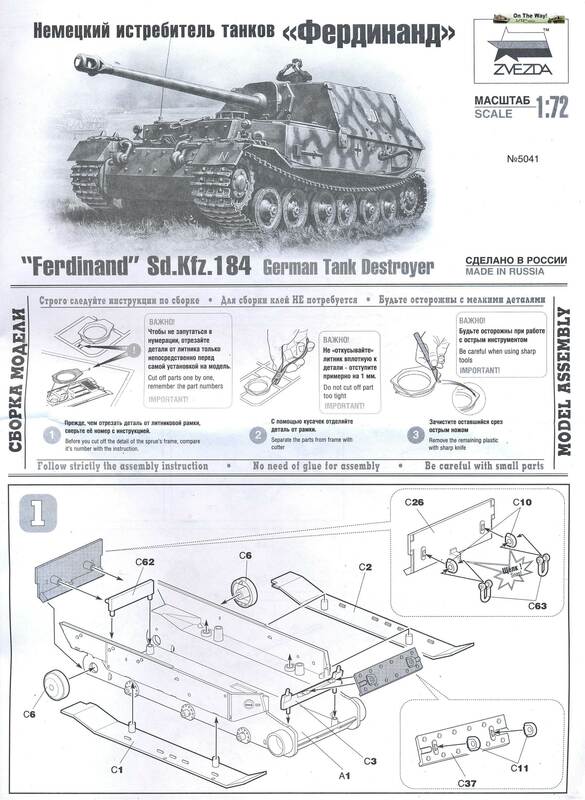 The marking instructions also show a toolbox on the back of the tank, which the kit doesn't provide. 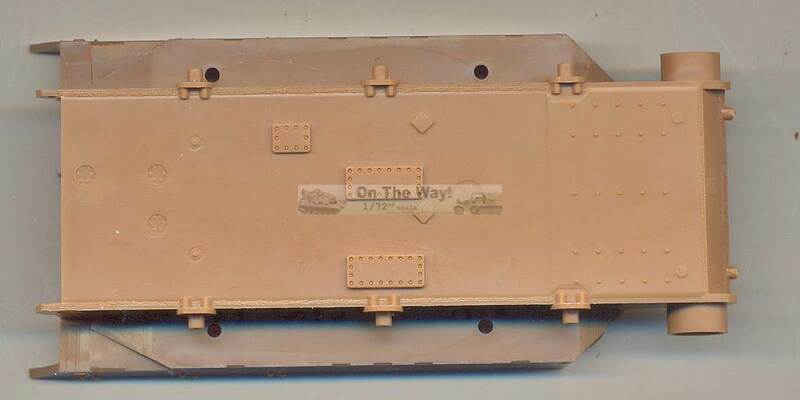 "501" is a well known vehicle of s.Pz.Jg.Abt. 654, which on 13 July 1943 became disabled in a minefield. It was afterwards captured by the Soviets and now rests at Kubinka (in a different camo scheme). 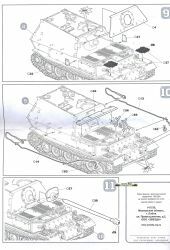 The marking options claim it is a s.Pz.Jg.Abt. 653 vehicle, but ask you to add the "N". So, basically, the markings are right (as is the camo scheme), but the caption is wrong. "612" is a vehicle of s.Pz.Jg.Abt. 654 (not 653 as the instructions claim), but pictures showing it in August 43 display a different font for the numbers. It should also carry the "N". 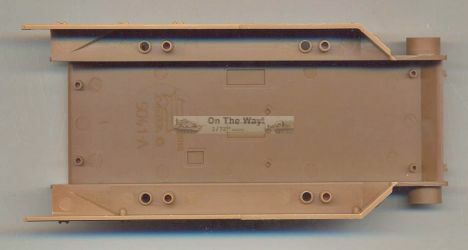 Bottom line: it seems that "501" can be safely selected and built using only the decals that are provided, while "612" requires a minor leap of faith regarding the font of the numbers. Also note that the Balkenkreuze in my kit were enough out of register to bother me. They were replaced with items from the spares box. 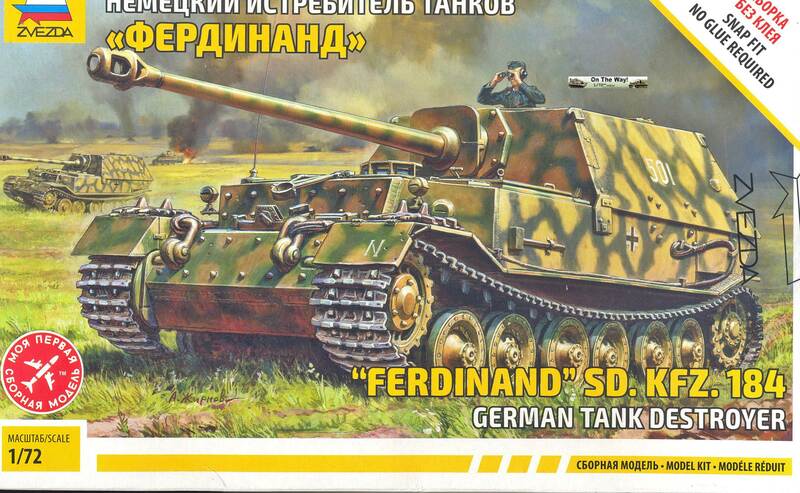 In general, a very good representation of the Ferdinand. OK, it's a bit short and the tracks need some attention, but it is very well detailed, and if you have a bit of patience, it goes together very well. Gert ten Brink shares some images of the construction of his Ferdinand. Review sample received from Zvezda through IPMS/Belgium.